An Italian Classic loaded with vegetables and beans, finished with hints of basil and oregano. This hearty tomato soup is made with diced tomatoes and butter, then seasoned with sauterne wine. black pepper, ground	 0 1/2 tbsp. 1. 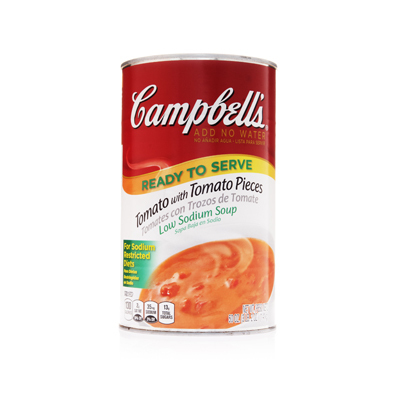 Heat Campbell's® RTS Low Sodium Tomato with Tomato Pieces Soup until warm. fresh basil leaves, chopped	 1 tbsp. fresh oregano leaves, chopped	 1 tbsp. 2. Add remaining ingredients. Bring to a slow simmer for 45 minutes. 3. To Serve: Using an 8 oz. ladle, portion 1 cup soup into soup bowl. Serve immediately. fresh basil leaves	 1 tbsp. fresh oregano leaves	 1 tbsp. black pepper	 0 1/2 tbsp.